Why We Love Employee Appreciation Day | gThankYou! Happy Employee Appreciation Day! Today is the Valentine’s Day of workplace holidays — both holidays are ultimately about building relationships. What’s a core element of relationships? Appreciation! Sharing appreciation is vital in the workplace, just like in any other relationship. We also know that appreciation is most effective when we celebrate it daily — after all, we don’t limit love to just one day of the year, right? Employee appreciation is the same way! Don’t miss Employee Appreciation Day! It’s a perfect opportunity to thank and connect with employees. Employee Appreciation Day is special in many ways that make it a not-to-miss holiday in the workplace. Read on for all the ways we love Employee Appreciation Day! For the past couple of weeks we’ve talked about why you should celebrate Employee Appreciation Day — how to involve bosses, what to do at the last minute, the employees to not forget, and more! Now, let’s cover all the feel-good reasons Employee Appreciation Day is awesome! That little boost you feel after saying “Thank You”? It’s not just in your head! Just as celebrating gratitude helps organizational health, gratitude is good for individual mental and physical health. We’re inundated with negativity on a daily basis, from angry Internet commenters to depressing news reports. Employee Appreciation Day gives you and your employees a respite by taking the time to focus on something purely positive: gratitude. And the great thing about gratitude (and its sister emotion, kindness) is that they spread quickly within communities. Acts of gratitude and kindness build more acts of gratitude and kindness. It’s that simple! Appreciation breaks down self-doubt and grants the recipient permission to be more authentic, more creative. “When managing the creative process, celebrating wins and awards is one effective way to reassure creative teams, whose members often question their own talent,” Francis Cholle writes in his LinkedIn post on workplace rituals. We wish you and your employees a fantastic Employee Appreciation Day! Want practical tips to build your Thank You culture every day this year? Download gThankYou’s FREE 2016 Day-to-Day Celebration Calendar for tips on how to plan daily recognition and organize regular celebrations throughout the year. 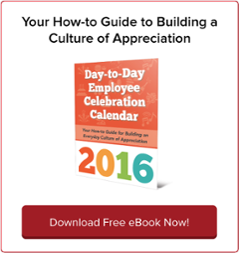 This one-of-a-kind eBook will help you to build an everyday culture of appreciation with month-by-month guides, case studies, research highlights, how-to recognition advice and celebration ideas for specific holidays and anytime. Click the image below to download your free copy!